In appearance other than colour, White Campion is very similar to Red Campion Silene dioica. The two species cope well in overlapping habitats and so are often seen growing together. Up to a metre in height, these hairy perennials stalkless upper hairy leaves in opposite pairs. The leaves are entire (not toothed) and oval with pointed tips, and near the base of the plant they have unwinged stalks. Flowers of White Campion grow in clusters and each flower has five bi-lobed white petals forming a corolla 2.5 to 3cm across. The calyx is long and inflated but much narrower than in Sea Campion and Bladder campion - the two other white Silene species found in the wild in Britain and Ireland. A mainly lowland perennial, White Campion is less frequently encountered than Red Campion Silene dioica in western Britain and Ireland but it is more widespread and common in eastern England. Found throughout central and southern Europe, but much rarer in Scandinavia, Silene latifolia is also present in the Algarve region of Portugal and in northern Africa. White Campion is a naturalised introduction to North America, where it is now found in the wild in most states of the USA. In areas where thereare both Red Campion and White Campion are present you may occasionally find what appear to be White Campion plants with pale pink flowers; these are simply hybrids of the two species. This creamy white member of the Silene genus often grows on waste ground, disturbed roadside verges and arrable field margins that are well drained. Unlike Red Campion, this species shows a marked preference for alkaline to neutral soils. In southern Portugal and parts of central Europe we have also come across White Campion just inside deciduous and mixed woodland, but more often in hot southern climates this is a woodland edge species. 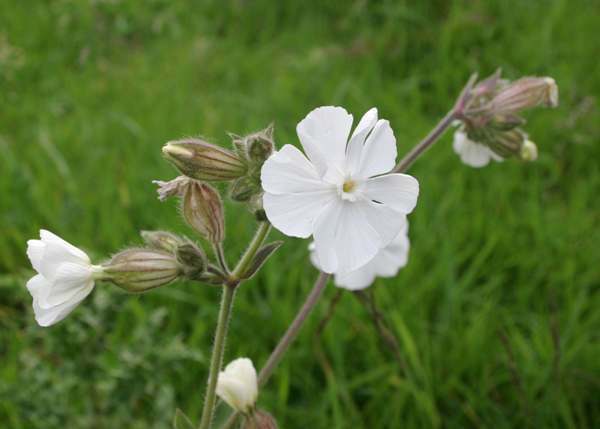 In Britain and Ireland the first flowers of White Campion appear in May, and displays are at their best through June and July with a few flowers usually lasting through to the end of September and the occasional straggler still evident in October. In southern Europe of course the first flowers appear much earlier - in late February or early March - and by the end of June the White Campion flowers are all dead as in all but the shadiest of sites the plants are shriveling up in the heat of high summer. Unlike many wildflowers, the flowers of White Campion remain open as dusk descends, at which time they are slightly scented and attract moths as pollinators. Plants of the genus Silene have roots that contain the compound saponin, which although a mildly toxic substance has long been used as soap for washing clothes, hair etc. 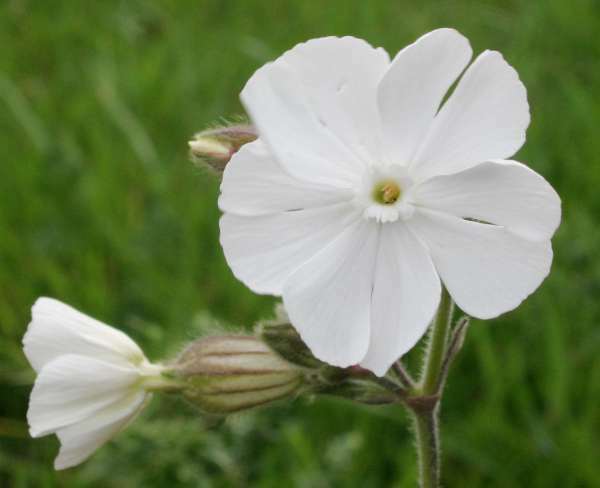 There are also references to some kinds of campion being used to treat snake bites and as a cure for corns and warts. Silene, the genus name, is a reference to the Greek woodland god Silenus the foster father of Bacchus, who was often depicted covered in a sticky foam and whose name in turn comes from the Greek word for saliva. (The female flowers of Red Campion Silene dioica secrete a frothy foam that captures pollen from insects that come to the flowers to gather nectar.) The specific epithet latifolia means 'with wide leaves' - and in the case of White Campion the leaves are generally wide in comparison with those of its close relative Red Campion. Two other campions, Bladder Campion - Silene vulgaris - and Sea Campion, are sometimes mistakenly identified as white campion. Bladder campion has branched flower stems and greatly enlarged sepal tubes (seed pods), while Sea Campion - Silene uniflora is a short plant also with swolen sepal tubes but having unbranched flower stems each topped by a single bloom. 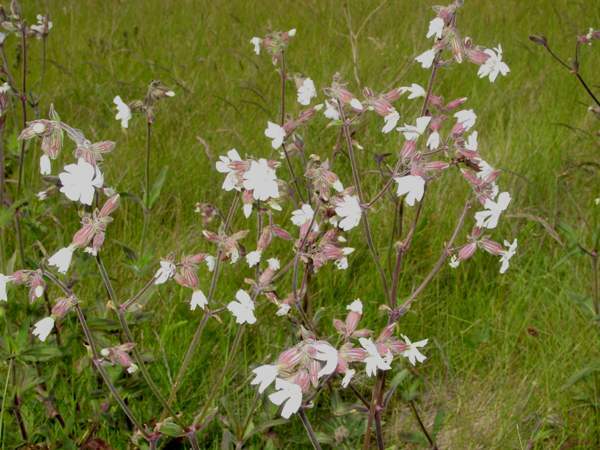 The White Campion plants shown on this page were photographed in England and in West Wales during June.